As one of the first customers and users of a BTurtle in the Ruhr area, we had got to know and appreciate Wolfgang during the Caravan Salon in Düsseldorf. During the detailed conversation, it quickly became clear that he has been offering guided bike tours through the Ruhr area and along other well-known cycle routes in Germany for a number of years, and in some cases even incorporates the Alpine Republic of Austria. Jean-Yves - Solar Trike and the Mini Caravan - just a try? Tinkerers and hobbyists are numerous - sometimes you do it off with a tired smile, then again you are amazed about the basic idea and then there are those who really implement their creative ideas into reality and .... use them too. It has only been a year since we had reported about the mini-caravan or B-Turtle of the company GentleTent from Vienna as part of our trade fair tours during the Caravan Salon Düsseldorf, which at the time was very well presented in the media on a large scale, which had led to huge interest by the visitors. 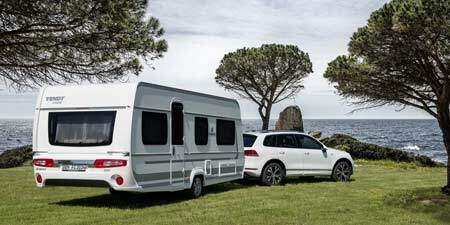 During last year's Caravan Salon in Dusseldorf and the CMT in Stuttgart countless inquiries were meeting with the air tent manufacturer GentleTent, when asking if renting the mini-caravan or better the B TURTLE will be possible in the future. In our report about the cycling routes in the Lednice region we had already announced another report on the used recumbent bike of AZUB, whose manager had made this test trip possible for us.